We just saw Gravity (starring Sandra Bullock and George Clooney) and it was hard on the heart, really. I don’t mean in a bad way but in a very good way. I was going to skip this movie but it garnered rave reviews which makes it hard to resist. And besides it just rained again in the Metro and streets were going to become parking lots in a matter of minutes so I’d rather spend 2 hours enjoying a movie than be frustrated and trapped in the pouring rain and flooded streets. The movie is not easy to watch. It’s not some lighthearted fare you can forget about when you exit the cinema. I felt myself getting stressed out, dizzy, and I had to remind myself that Sandra Bullock is safe somewhere in the US and this is just a movie and George Clooney is probably out and about trying out his latest “girlfriend.” We watched it on a regular 2D screen. I can’t imagine how nerve wracking and disorienting the experience would be in 3D IMAX. I like the injection of humor, that mostly comes from Clooney. Sandra’s character was a tad annoying at first but in the end, you’ll root for her to go home. The little twist in the story is a brilliant move as it just elevated the story more. If you think this is just a movie about an astronaut’s survival in space, you’d be so wrong. Go see it. It’s really worth the ticket price. If you haven’t heard his performance as angel Islington in the BBC radio drama “Neverwhere,” based on the book by Neil Gainman, I highly recommend you listen to it and be prepared to be mesmerized. He sings a few ominous lines if you need more motivation to search for it. I’ve been meaning to watch this series for years but there were so many other new shows that keep popping up that it’s only now that I got the chance. Carnivale is a TV series produced by HBO and created by Daniel Knauf, a former insurance broker, who now writes and produces various TV series. It came out in 2003 but was cancelled after 2 seasons. I guess the subject matter was just too weird for most audiences. The bleakness of the setting – Great Depression in America’s Dust Bowl didn’t help either. I’m not finished with Season 1 yet but I’m determined to see both seasons. I got to admit that it’s not like some of my more favorite TV shows like Sherlock and Game of Thrones where I’d be willing to forego sleep just to see the conclusion. But the subject matter, circus “freaks” and dark religious elements certainly are intriguing. So far, the episode that truly stands out is the ghost town episode, Babylon. It’s deliciously creepy especially the last scene. I still got a lot of episodes to go through and I’m dreading the last episode in season 2 when I’ll know if it’s going to end on a cliff hanger and leave me with no proper closure just like my dear Pushing Daisies. The next book on the list is Remarkable Creatures by one of my favorite female authors, Tracy Chevalier. Her most well-known book, The Girl with the Pearl Earring, was made into a movie starring Colin Firth and Scarlett Johansson. That was my favorite and the first book I’ve read of hers. 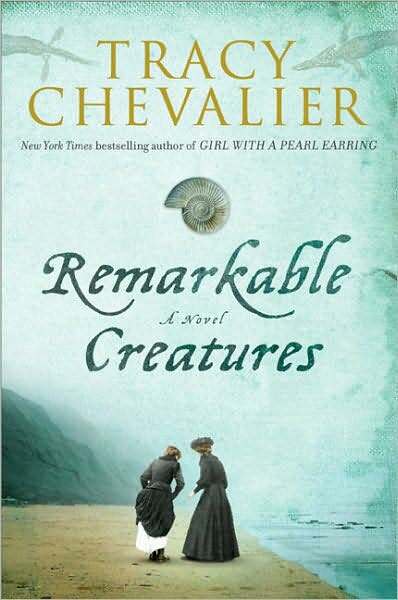 Remarkable Creatures came out years before in 2009 but I was hesitant to buy it when I read the story was about some female fossilists in the 1800s. I thought I wouldn’t be interested but how wrong I was. I loved the story of Mary Anning and Elizabeth Philpot. I could totally relate to them as I, myself am about society’s next casualty in the search for Mr. Right. How could I ever doubt the wisdom of Tracy Chevalier? I’ve collected her works over the years but The Girl with the Pearl Earring still holds a special place in this bookworm’s heart. Remarkable Creatures, as you may already deduce from the synopsis at the back of the book, is not full of dark twists and turns, nor does it have scandalous intrigues or any nail-biting trill rides. It’s almost like reading a Jane Austen with a bit more substance. The drama is very subtle which could turn off most people. I appreciated the story and landscape though. From this busy city, I was transported to the misty shores of Lyme Regis, looking at fossils at it’s cliff walls and sandy beaches. I must tell you it’s a welcome escape especially since I read most of it while commuting and stuck in traffic. I almost forgot that the characters actually existed. I just googled Mary Anning when I was more than halfway through the book. It made the story even more interesting to me. Although it was quite a spoiler when I read William Buckland actually married someone else. It’s an awww moment as I loved his eccentric character. He’s my kind of a goofy nerd. All in all, I highly recommend this to someone who loves Jane Austen (surprise reference included), historical novels and of stories that are nuanced and not overly dramatic.